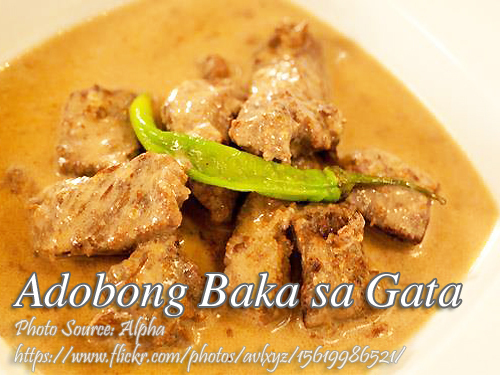 Adobong baka sa gata is one of the many Filipino dishes that comes from the original classic adobo dish. There are many variations of adobo and there are varieties of meat used in cooking this dish. Beef is one of them, and most of the time soy sauce is the main stay listed in the ingredients. But this adobo does not have soy sauce and instead, it uses coconut milk. If you ask me, this is much more related to the ginataang isda (fish with coconut milk) that combines coconut milk and vinegar. To cook beef adobo in coconut milk; Heat the oil in a deep pan. Sauté onions and garlic. Add beef and saute until color changes. Add vinegar, salt, pepper and do not stir. Cook over moderate heat until liquid is reduced to half. Add water and cook covered until beef is tender. Add coconut milk and finger chili pepper and allow to simmer for 10 minutes over low heat. Pour in coconut cream and allow to simmer for another 5 minutes over low heat. Adjust seasoning if necessary. Heat the oil in a deep pan. Sauté onions and garlic. Add beef and saute until color changes. Add vinegar, salt, pepper and do not stir. Cook over moderate heat until liquid is reduced to half. Add water and cook covered until beef is tender. Add coconut milk and finger chili pepper and allow to simmer for 10 minutes over low heat. Pour in coconut cream and allow to simmer for another 5 minutes over low heat. The Best Panlasang Pinoy Recipe. I like it very much. Thanks & God Bless. Recipes are easy to follow. Like na like ko ang Panlasang Pinoy. Thanks for sharing. How much coconut cream? It is not in the ingredients. Thanks! Hi Mark, thanks for your feedback. I’ve corrected recipe already. Check it again.